Coalesse Hosu Lounge With Ottoman (SCCOHOLO) at Pure Design / Seating / Lounge ::: Furniture for the Home, Office, Home Office, and More at Pure Design Online! 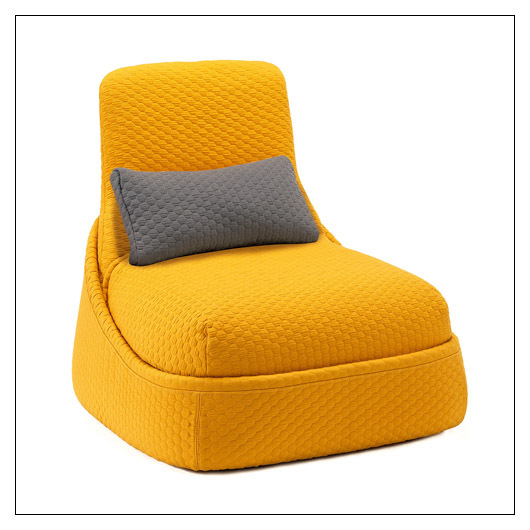 The Hosu Lounge With Ottoman is perfect for business or pleasure. Pull the tab on the seat cushion to unfold the attached ottoman for extra comfort. Hosu features convenient rear and side storage pockets and cord pass-through. Designed by Patricia Urquiola, this unique work lounge creates a comforting space to relax and get things done. Frame design allows back to flex to support occupant's back shape. Covered in Hexa, a recycled multi-layer polyester with a sewn in pattern. Winner of the iF Design Award - Gold, 2013 and Red Dot Design Award - Product Design, 2013. Includes one lumbar pillow. Fabrics will appear loose with comfort wrinkles when upholstered. Large glides. Images are representative, not exact: this lounge ships with Caviar (dark) footrest and Black pulltab by default, but conact us after you order if you would like a different footrest or pull tab color, including the combinations shown here. This product is MADE TO ORDER and therefore CANNOT BE RETURNED. Please allow an additional 6 weeks to ship. This item can only be shipped to street addresses in the contiguous 48 United States.